I got caught with my hand in the Play Doh cabinet again. I found these cute little bread cutters, washed them off and made these mini sandwiches today. I cut Stretch Island grape fruit leather faces for both of them. Just above the sandwiches are picks of green and black olives. At the top left are raspberries and top right are blueberries. Little Miss 2 year old is my finicky eater. She had three little birds today for her lunch. My kids love that Bob Marley song. A pick of black olives is just above the sandwiches. Raspberries, blueberries and a cantaloupe bird are at the top. 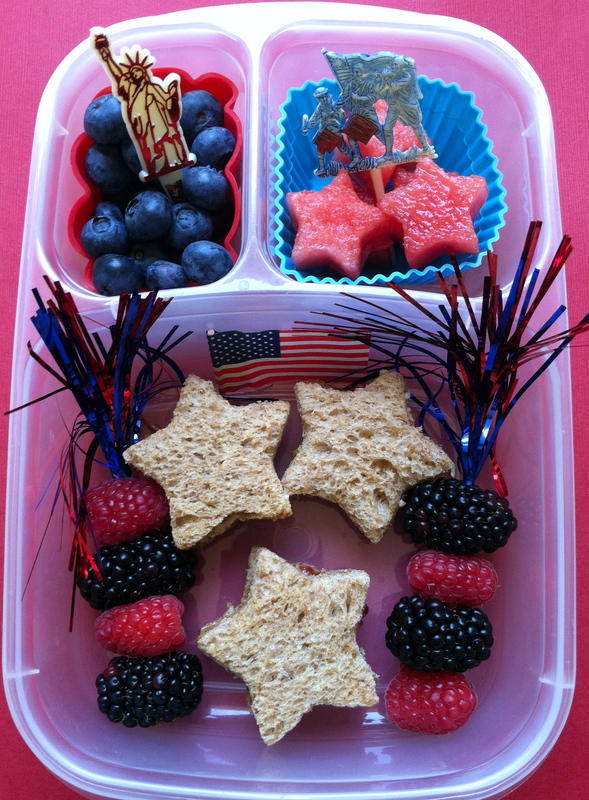 Both lunches are packed in Easy Lunch Boxes. And I’m working on a local food story so my husband’s lunch today included foods I purchased at the local farmer’s market. The base of the salad is baby spinach leaves. 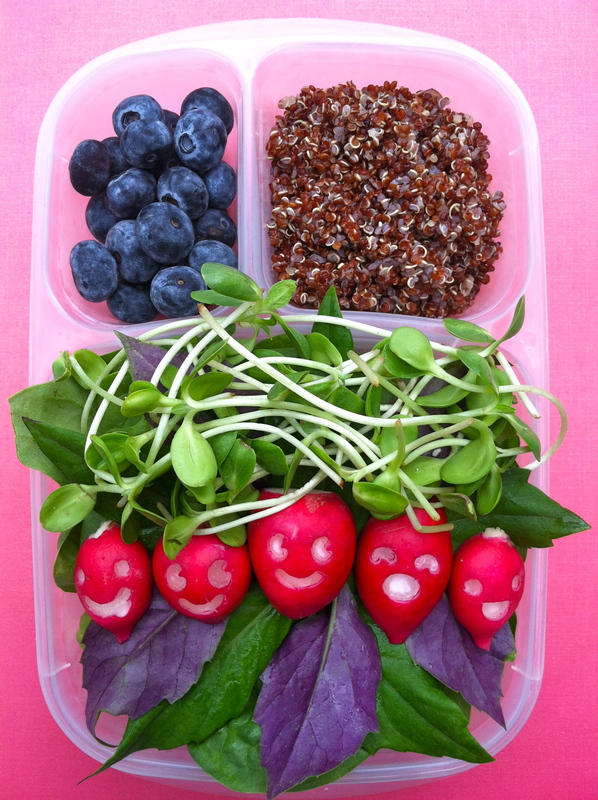 I placed okinawan spinach leaves (purple and green) on top for color and for him to try, organic radishes which I bentoed out with these cute faces, and topped the salad with fresh sunflower sprouts. I had never seen the okinawan spinach before so we had to try it. Here’s a link to find out more about okinawa spinach. Besides adding awesome color, it apparently has cholesterol lowering properties in it. All of the ingredients came from My Mother’s Garden at the Sarasota, FL Downtown Farmer’s Market on Saturdays. 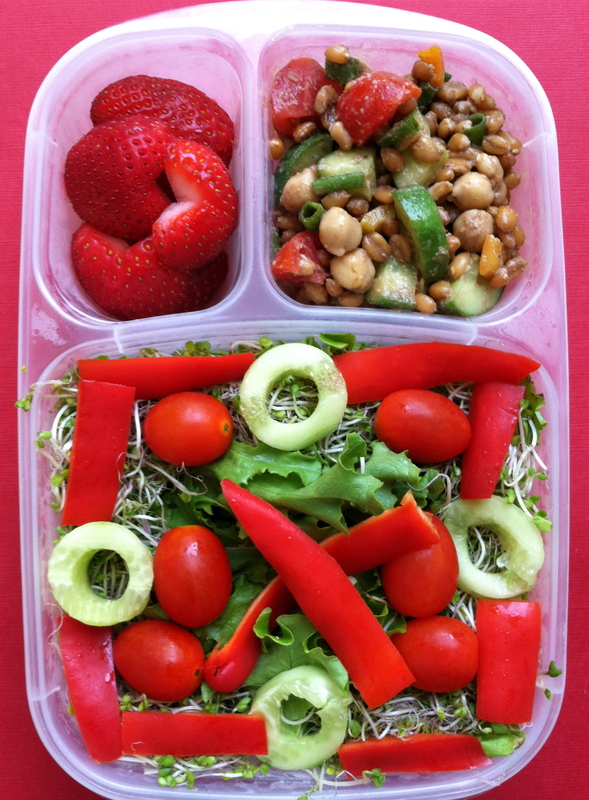 In the top compartments are organic blueberries and organic red quinoa at the top right (cooked in vegetable broth) packed in an Easy Lunchbox container. 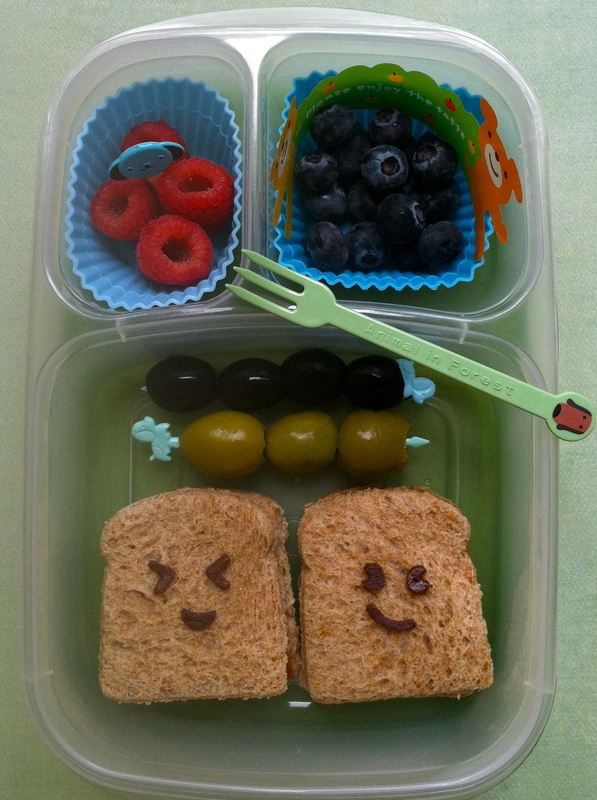 Tags: baby spinach, bento, black olives, blueberries, Bob Marley, cantaloupe, EasyLunchBoxes, faces, funny face, green and purple spinach, green olives, kids, lunchbox, mini fork, mini sandwiches, mini spoon, okinawa spinach, plant-based, radish faces, radishes, raspberries, raw food, red quinoa, salad, summer, sunflower sprouts, Three Little Birds, vegan, vegetarian. My kids love Play Doh. I really hate the mess it leaves. What I DO love is the Play Doh cutters. 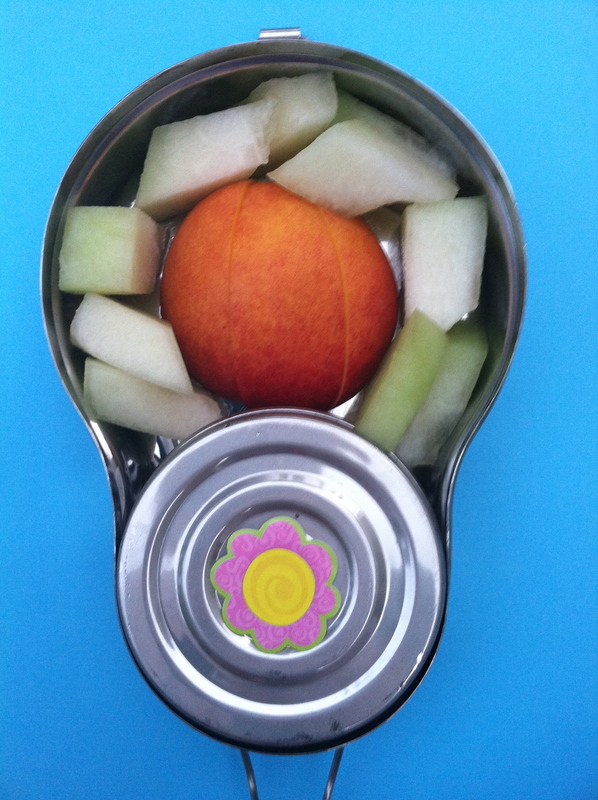 As a bento lunch freak, I look at everything as an idea for a lunch. I have used Play Doh and play kitchen cutters (well washed, of course) to cut kid foods before. 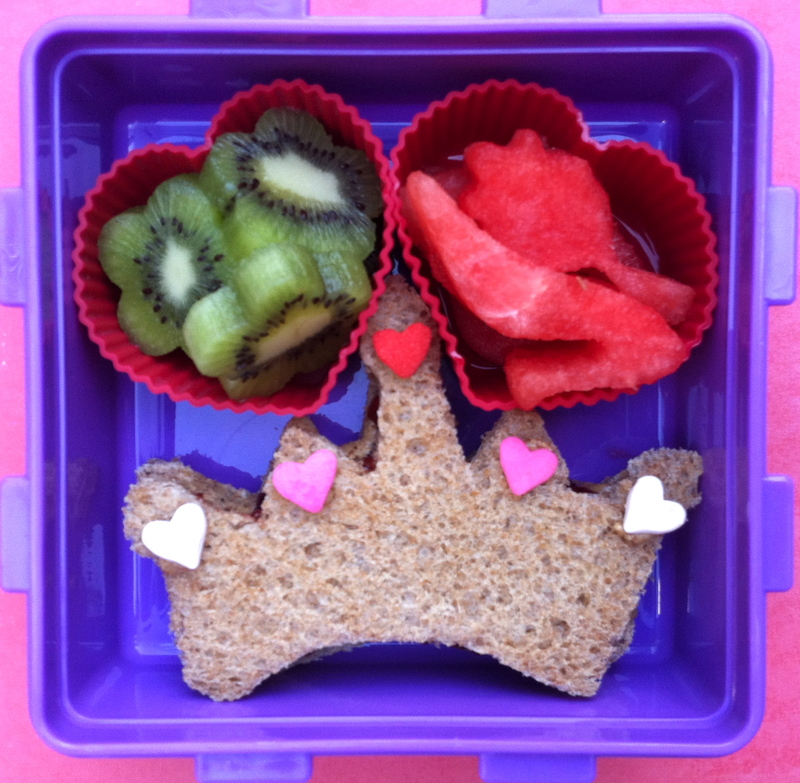 I used a cookie cutter this sandwich to make the princess crown. The sandwich is Justin’s Almond Butter & Jam on Rudi’s whole grain bread. I also stuck a few candy hearts on the crown for the jewels with almond butter. At the top left are kiwi flowers and the top right are watermelon shoes and magic mirrors for my little princess. This time of year seems to drain many of us having to buy new shoes, school supplies, uniforms, tuition and just paying for growing kids in general. 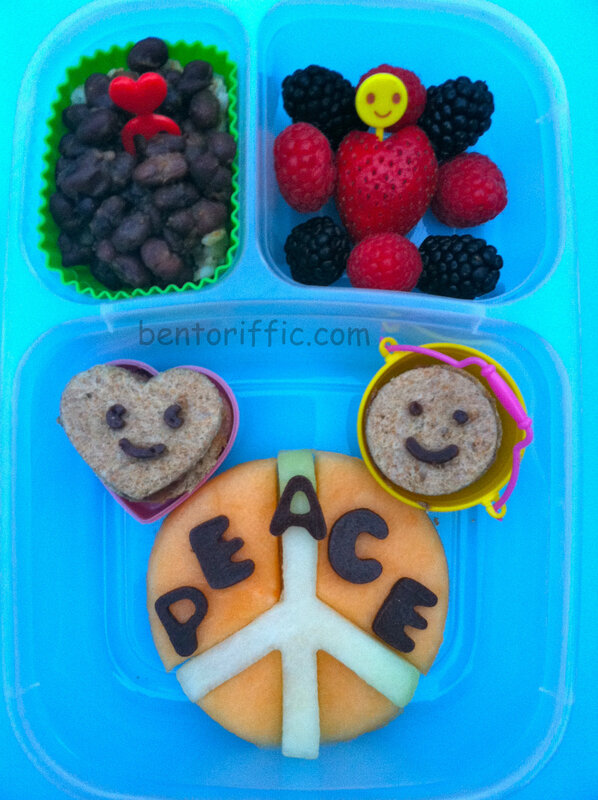 Cristi from BentOnBetterLunches did a great post on how to make budget bentos. She is a mom of 5, and has such a wonderful eye for organization, fresh ideas and keeping kids well fed. 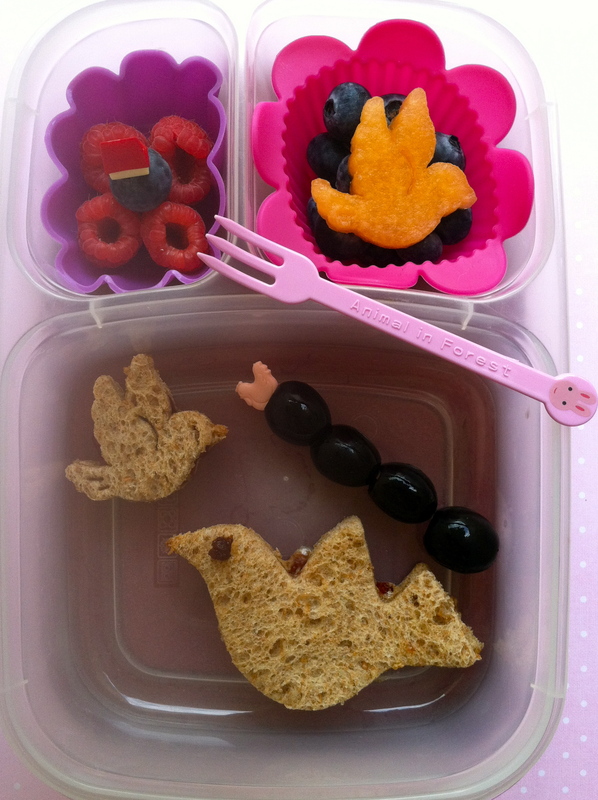 I love that she finds use out of every day items like Play Doh cutters, paper muffin cups and rubberbands that make great bento items. Her post here on Budget Bento by BentOnBetterLunches can help give you some creative ideas for lunches without spending a penny! Thanks for the inspiration, Cristi. Little Miss A, my 2 year old, is having mini square sandwiches. She has been licking the filling off of the bigger sandwiches I made for her and leaving the bread. When I switched to something more bite sized, she seems to pop the whole thing in her mouth. I used the FunBites Cube It cutter to cut the bread and then filled the sandwiches. In the middle is a silicone heart shaped container with seasoned pumpkin seeds. The sandwiches are surrounded by dried cranberries. 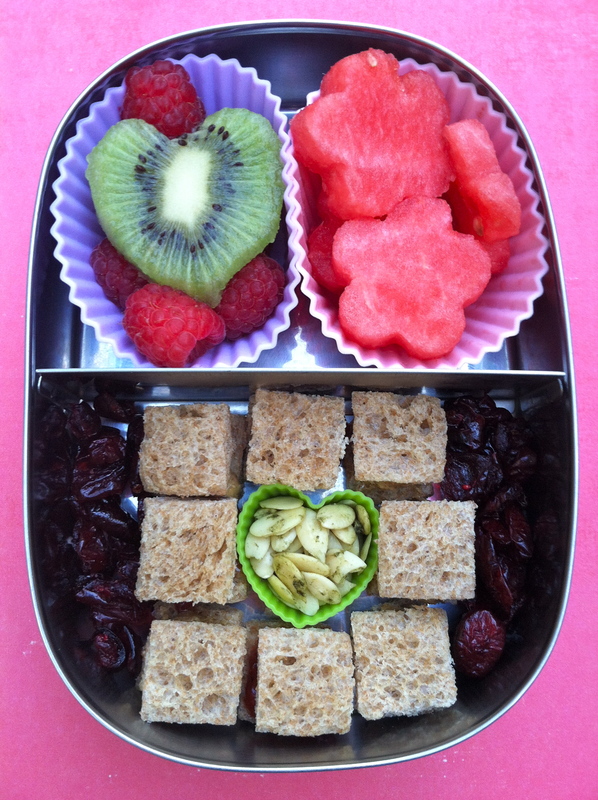 At the top left are raspberries with a kiwi heart on top and at the top right are watermelon flowers. The lunch is packed in a LunchBots Duo stainless container. Chevrons have resurfaced in design, fashion and now I’m putting them into my food. I love them. The bright colored Vs in this salad are all different colored sweet peppers. 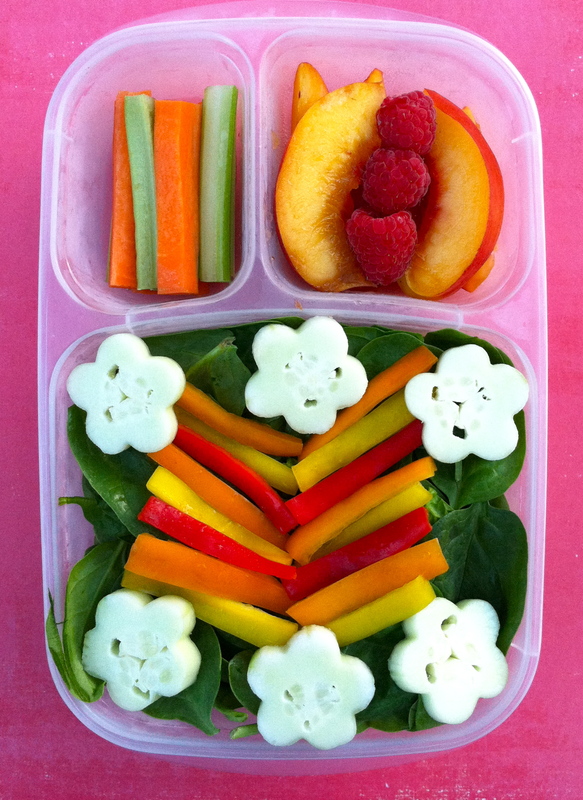 Underneath the salad is baby spinach and around the salad are cucumber flowers packed in an Easy LunchBox. At the top left are carrot & celery sticks and at the top right are fresh nectarine slices & raspberries. Don’t forget to enter my reusable straws and lids giveaway by GreenPaxx. I couldn’t resist. The girls have Mouse fever. Like Hello Kitty, they can never get enough of Disney. I found some Mickey & Minnie sandwich cutters on eBay, and I had to have them. I made them chocolate almond butter and agave nectar sandwiches with fresh fruit. From the top are pineapple, pear, mango and apple mice inbetween the sandwiches. I found the fabulous vintage looking plate on clearance at my local Target store. I rely on a few websites for great tasting, vegan recipes. This one is adapted from Oh She Glows. Angela Liddon has amazing, original recipes that taste great. 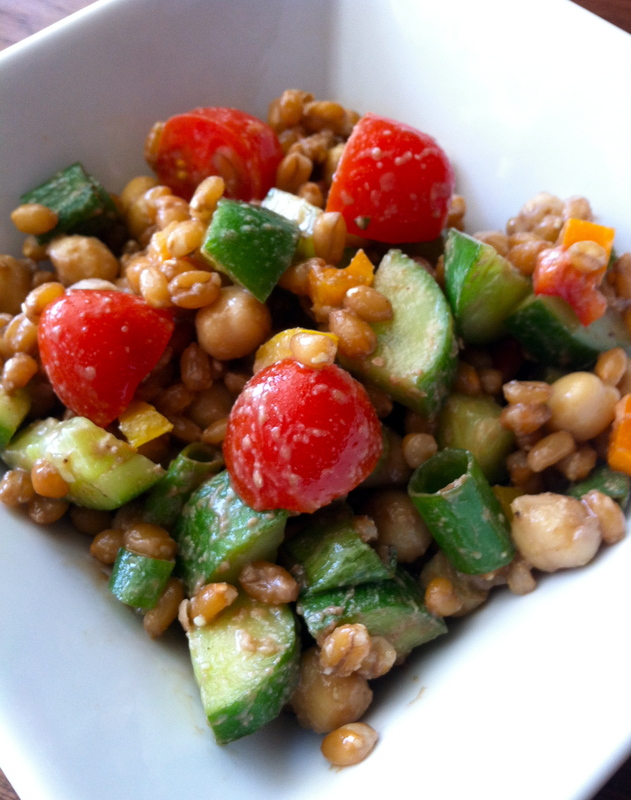 This one’s called the Back On Track Wheat Berry and Bean Salad. You can revise it how you like as I did. I had spelt berries and garbanzo beans in the pantry which is what I used. I love extra vegetables so I used lots of grape tomatoes, cucumbers, 3 colors of sweet peppers and green onions. The dressing is also by taste. It’s a great, filling salad for summer or a potluck dish too. My husband is having a mixed green salad with broccoli sprouts along the sides. On top of the sprouts along the edges are sweet red peppers and cucumber Os. 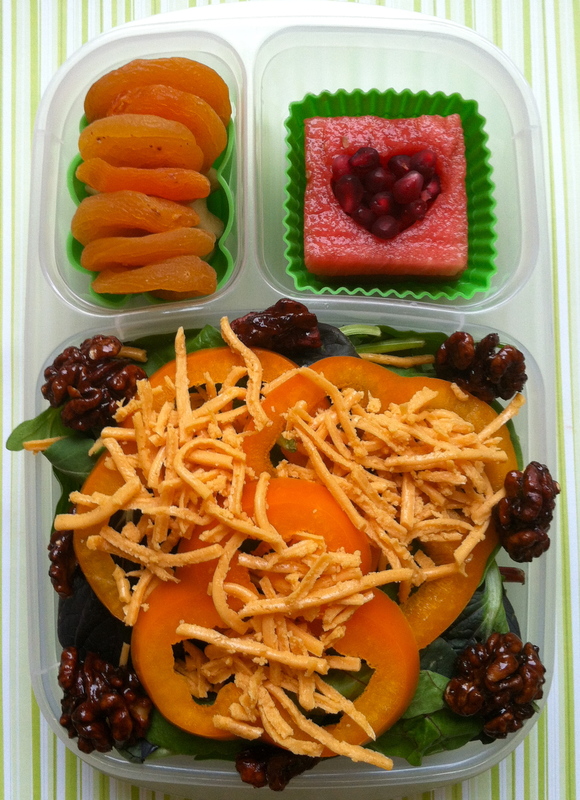 His side of spelt berry salad is at the top right and heart shaped strawberries at the top left packed in his Easy LunchBox container. 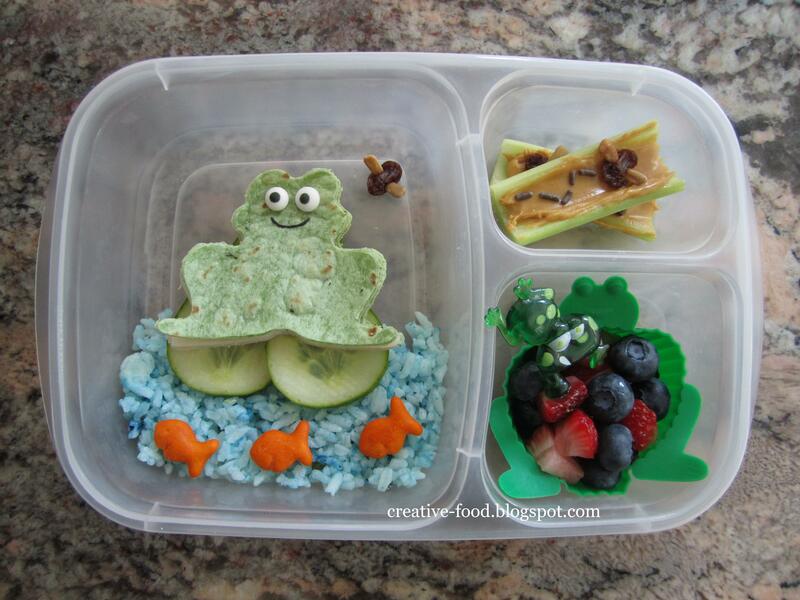 Creative Food guest post-a fun frog lunch! Hi everyone!! I’m Michelle from Creative Food(creative-food.blogspot.com). I’m so happy to be here on Bentoriffic! 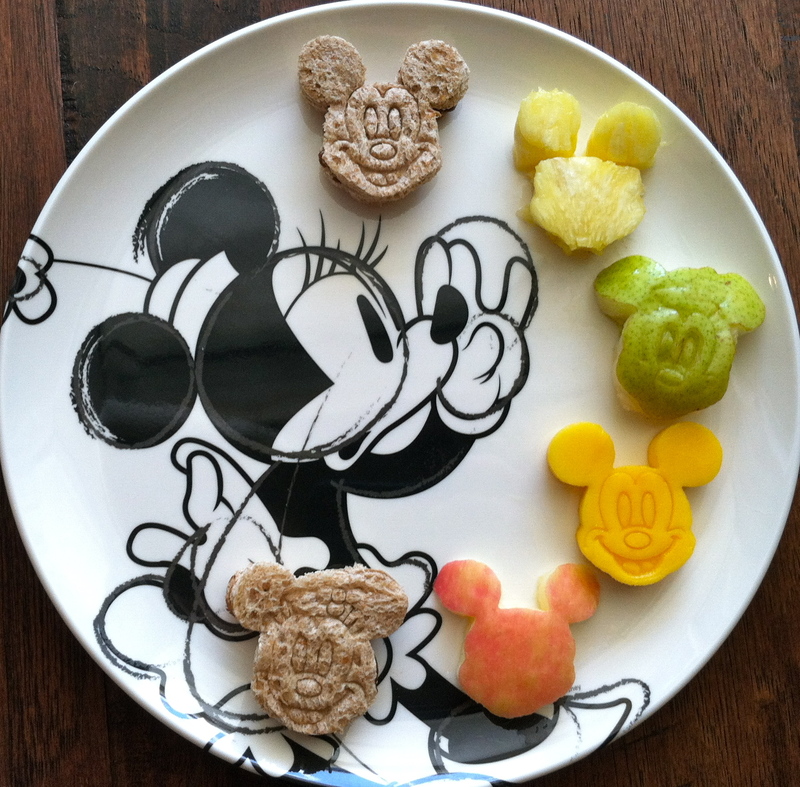 I am such a fan and am always in awe of what Sarah creates for her little girls Miss G and Miss A. I am such a fan of Sarah and her food artwork. She is incredible! Even though I haven’t met her in person (yet!) I am happy to call her my friend 🙂 So here I am honored to guest post on her amazing blog! My blog, Creative Food( creative-food.blogspot.com), is a collection of snacks and lunches that my daughter Eliana and I make together in the kitchen. I started making creative food because she would literally live off of bread alone if it were up to her. So I began to present fruits and vegetables in a fun and creative way to encourage her to eat better, which has worked tremendously! It is fun creative outlet for me, and she loves it (win, win!) We also found out this year that Eliana is allergic to peanuts, cashews and pistachios, so most of the meals (with a few exceptions) are peanut free and nut free. The frog is a ham and cheese sandwich on a spinach tortilla cut with a frog cookie cutter. I added edible candy eyes and used a food safe marker to draw a mouth.The lily pad is sliced cucumber.The “water” is white cilantro lime rice dyed blue. (I took some leftover rice, put it in a bowl and mixed in two small drops of blue food dye.) I added some goldfish crackers for added cuteness 🙂 The fly is a raisin with sunflower kernel wings (you can easily put almond slices as wings instead. For example see my spider lunch (http://www.creative-food.blogspot.com/2012/06/very-busy-spider-lunch.html) Eliana isn’t allergic to almonds but has now decided she will not eat them either because they are a nut). In the upper right Eliana had some “flies on a log” (raisins, sunflower kernels wings, and I.M. Healthy Creamy Honey Soynut Butter on celery. Chocolate sprinkles were used to show the path of the fly). In the bottom right she has a fruit salad or blueberries and strawberries in a frog silicone cup. Eliana wanted to add the cute frog pick to finish the lunch! This week is jungle week at preschool summer camp for the girls. They are obsessed with monkeys already. I happen to think it’s because they can relate to their behavior at 2 & 4. They’re wild, they like to run around and make tons of noise, throw things, and thank goodness they’re cute…what’s not to like? Miss G is having a monkey face. I used a biscuit cutter for the top part of the head and a large oval (Easter egg) cutter for the mouth portion of the sandwich and trimmed the edges a bit. Then I used a smaller circle cutter for the ears. It’s all made from Rudi’s Honey Wheat bread and filled with Justin’s Almond butter and strawberry jam. I used the almond butter to stick on the fruit leather mouth, nostrils and pupils. The eyes are Vegan brand cheese. The face is on 2 romaine leaves and there are halved prunes underneath to prop up the ears and mouth & keep them from falling. I also included heart shaped strawberry halves. 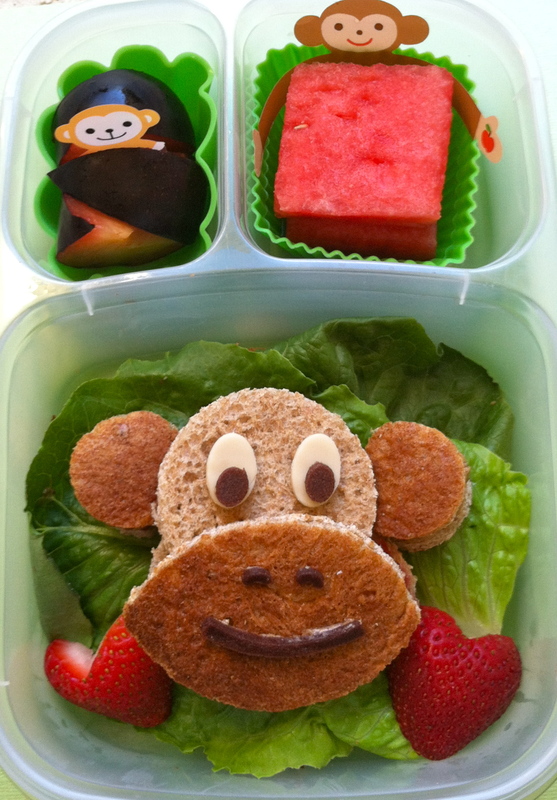 At the top left are plum sections with a piece of monkey baran (food separators) and at top right are watermelon squares with another monkey packed in her Easy Lunch Box container. Little A is having a monkey swinging from a broccolini tree. I used a cookie cutter for this one and made the face from Stretch Island fruit leather. I also cut “bananas” from pineapple chunks. Miss G and I have a severe banana allergy so we can’t have the real thing in the house. I hung the bananas in the tree along with a monkey pick. 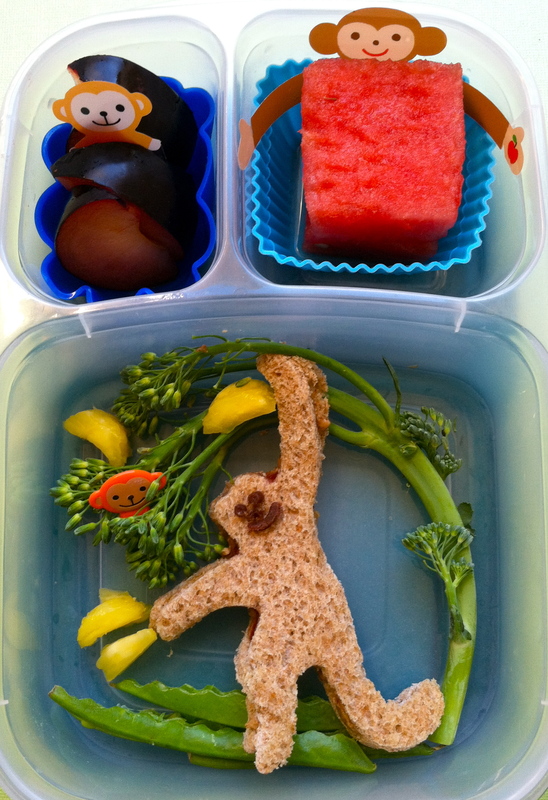 Underneath the monkey are crinkle cut sugar snap peas for the jungle floor packed in her Easy Lunch Box container. My husband’s salad is very orangey today. Orange foods are full of the antioxidant carotenoids which help reduce inflammation, enhance the immune system and are a great source of vitamin A for things like healthy skin and vision. He has baby bok choi and other mixed baby greens. On top are sliced orange bell peppers, Daiya vegan cheese shreds and carmelized walnuts around the sides. At the top left are cashews underneath dried apricots. 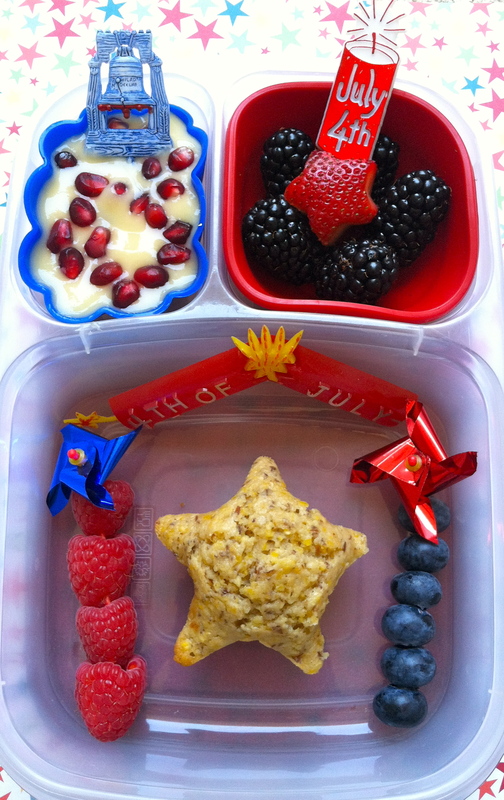 At the top right are watermelon squares, a heart cut out of the middle is filled with pomegranate seeds packed in his Easy Lunch Box container. Hope everyone has a great weekend planned. Happy Friday!